Governor Rochas Okorocha has said that he is leaving behind a viable and secured state, and that his administration in the State from 2011 to 2019 saw the disappearance of kidnapping, armed robbery, ritual killings, baby factories, militancy and other organized crimes in the State. 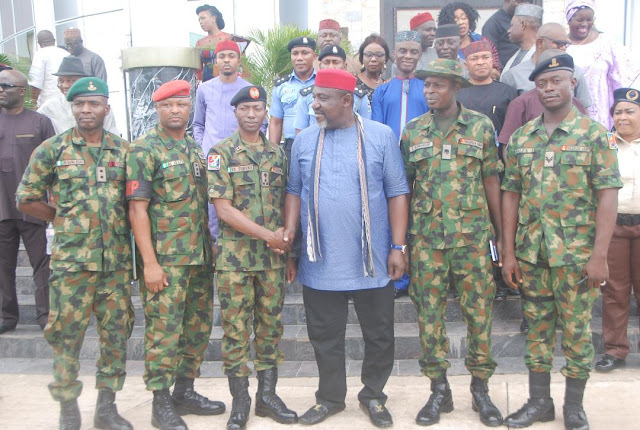 Governor Okorocha spoke when he received the new Commander, 34 Field Artillery Brigade (FAB) Obinze Brigadier-General Yusuf Tukura when he came on Courtesy Call at the Government House Owerri, on Monday, April 8, 2019, adding that he would not be happy to hear that these crimes are back to the State when he has left. The governor also explained what he is going to the Senate to do, stating that he would pursue the policy of Free Education so that the children of the poorest in the society would have hope of survival in Nigeria and to rebuild the political bridge that has linked the South-East with the rest of Nigerians. His words “I also want to use the opportunity in the Senate to rebuild the Political Bridge that has linked the South East with the rest of Nigerians. The Political Bridge is somehow faulty and it is dutifully incumbent on me to rebuild this bridge so that Igbos will play a recognized role in the Politics of the Federal Republic of Nigeria”. He continued “I am going to the Senate to promote the course of ordinary Nigerians. These are some of the things I am going to the Senate to do. Otherwise, I have no business there”. He added “We have enjoyed a very good working relationship with all the past Army Commanders and we are hopeful it will continue. Imo is a peaceful State. It was made peaceful through the efforts of the rescue mission government, in partnership with other Security Agencies in the State”. For him “The transformation you have seen in Imo State eight years down the line is as a result of Sacrifice. A leader who does not make sacrifices has no business with leadership. What you are seeing in Imo is a product of sacrifice. Sacrifice of self, Sacrifice of Comfort and personality, denial of yourself who you are, that you might serve your people well”. He continued, “I will advise you Brigadier general to set a target for yourself on what you want to achieve in Imo State as the Commander in the State. You have brought us message of peace and so we want you to maintain peace and tranquility. You should serve Imo people as your own home. Today you are in Igbo land as a Brigade Commander so you are automatically an Igbo man now, it is the attitude that will guarantee peace in Nigeria”. In his speech earlier, Brigadier-General Tukura said he had come on the courtesy call to inform the governor that he has assumed the Command of the Brigade, and to familiarize himself with the governor. He informed that he was here in 2011 and is back to the State in 2019 and commended the governor for the transformation that has taken place in the State between 2011 and 2019.